Tumors and tumor-like lesions of the patella are rare,,,,,, with benign lesions occurring more frequently than malignant lesions. Fractures of the patella are relatively uncommon and account for 1% of all musculoskeletal system fractures.,,, These fractures can be managed by traditional bonesetters with attendant complications, as a number of those who sustain these injuries resort to them. Traditional bonesetters are commonly found in most developing nations, and they play a significant role in the treatment of fractures in these nations. The aim of this paper is to report a case of patella gigantism following a patella fracture, which was treated by a traditional bonesetter. 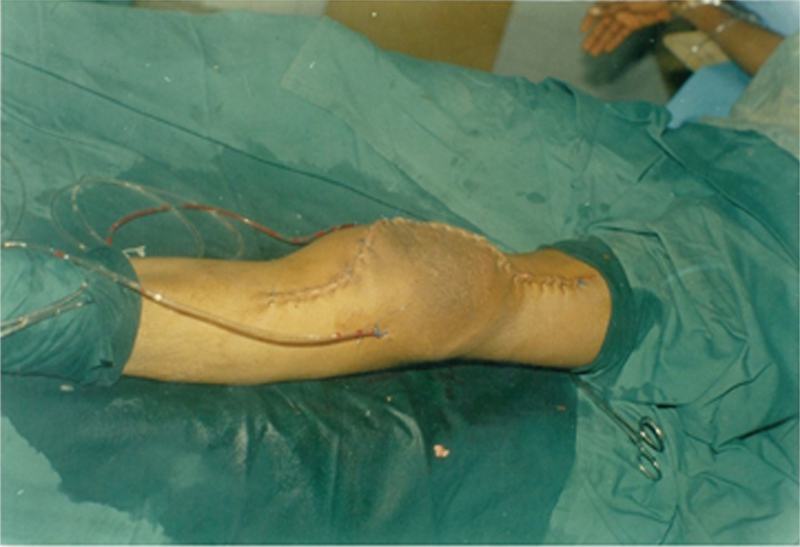 An 18-year-old male Nigerian presented to a Nigerian hospital in March 2006 with a 2-year history of anterior left knee swelling following a motorcycle accident. He had sustained closed injury to his left knee with a loss of active extension, associated with acute swelling. A diagnosis of patella fracture had been made radiologically, immediately following his injury, but he declined orthodox treatment and went home. Thereafter, treatment had been from traditional bonesetters, who were massaging the knee regularly using native concoctions/pastes for about 2 years. He had no constitutional symptoms. Physical examination revealed some wasting of the left lower limb with a grossly enlarged left knee. The anterior swelling, which was bony and mobile (patella), measured 32 and 22 cm in the vertical and transverse diameters, respectively [Figure 1]. There was some effusion, and the range of motion in the knee joint was 10–75° of flexion. Radiograph of the affected knee showed an enlarged patella with granular opacities. His chest radiograph was within normal limits. His genotype was AS, and the full blood count, blood chemistry and urinalysis were within normal. He underwent patellectomy and reconstruction of the extensor mechanism of the left knee. Operative findings included a patella measuring 22 cm × 18 cm [[Figure 2] and [Figure 3]], adherent to the overlying fascia and weighing 0.5 kg with gross thickening of the knee joint capsule and synovium. One hundred milliliters of amber-colored synovial fluid was evacuated from the knee. [Figure 4] shows the immediate postoperative photograph. Histopathological report of the excised patella revealed patella sclerosis. No cysts were found. There was no cortical disruption, and no evidence of malignancy was found. The patient made an uneventful recovery and presently walks about unaided. The patella is roughly triangular in shape with the base proximal and the apex distal., The patella in an adult measures 5 cm in diameter, although limits of length varying from 47 to 58 mm (4.7–5.8 cm) and width from 51 to 57 mm (5.1–5.7 cm) have been described. The weight of normal dry human patellae was reported by two studies, one among those of Iraqi ethnicity and the other among those of Japanese ethnicity. In the Iraqi study, the mean weight of dry human right patella was 7.06 g (range = 4.21–11.07 g), and that of the left was 7.04 g (range = 3.28–12.91 g). In the Japanese study, the combined mean weight of the right and left patellae was 7.178 g. The range for the right patellae was 4.281–10.832 g, and that for the left was 4.240–13.195 g. The index patient had a patella, which measured 22 cm × 18 cm, which is almost four times the measurement cited in the literature and it weighed 0.5 kg. The weight of the excised patella is about 70 times the mean weight of dry human patella. We propose that any patella, which weighs this much (0.5 kg) and above should be regarded as a giant patella. The giant patella that was encountered in this patient may have been due to the treatment by the traditional bonesetter. The treatment consisted of massaging the knee regularly. Regular massage of an injured part is a common form of treatment by traditional bonesetters in this environment. With the patella fracture that had occurred in the patient, the massaging may have stimulated more vascularization of the patella. The patella has a rich blood supply,, which in the face of fracture may lead to hyperplasia as the callus forms. Hyperplasia of the patella has been associated with infection and trauma of the patella, with or without fracture., However, in the present report, the hyperplasia is extensive giving rise to the giant patella. This is a unique sequela of massaging as a form of treatment by traditional bonesetters. Patellectomy together with reconstruction of the extensor mechanism is a recommended treatment option for patella tumors.,, The index patient had this form of treatment and did well. Reasonable knee function has been reported after patellectomy,, especially when formal rehabilitation is instituted. Hence, patellectomy will, therefore, be advantageous in the long term. Patella gigantism can occur following treatment of patella fracture by traditional bonesetters. We recommend patellectomy and reconstruction of the extensor mechanism, whenever a giant patella is encountered. Carpenter JE, Kasman R, Matthews LS. Fractures of the patella. 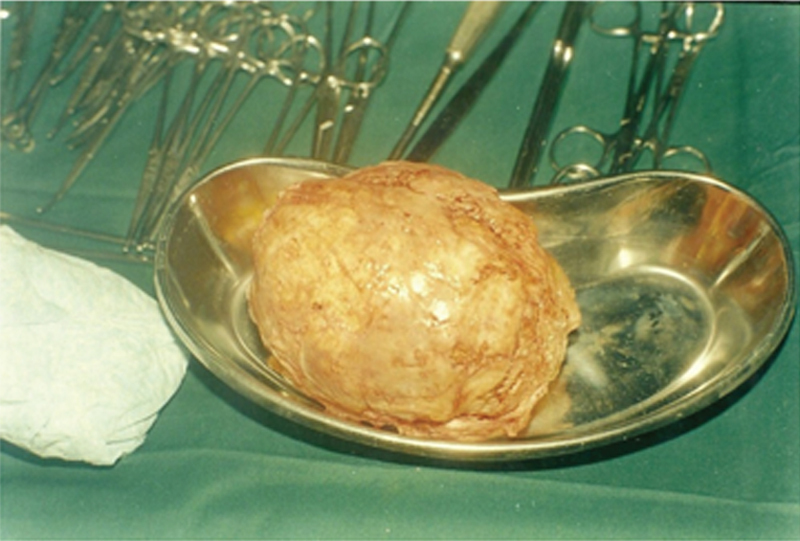 J Bone Joint Surg Am 1993;75:1550-61. Clemente CD, editor. Osteology: The Patella. Gray’s Anatomy of the Human Body. 30th American ed. Philadelphia: Lea & Febiger 1984. p. 282-4. Snoeckx A, Vanhoenacker FM, Gielen JL, Van Dyck P, Parizel PM. Magnetic resonance imaging of variants of the knee. Singap Med J 2008;49:734-44. Kaufer H. Mechanical function of the patella. J Bone Joint Surg Am 1971;53:1551-60. Grelsamer RP, Weinstein CH. Applied biomechanics of the patella. Clin Orthop Relat Res 2001;(389):9-14. Mercuri M, Casadei R. Patellar tumors. Clin Orthop Relat Res 2001;(389):35-46. Ferguson PC, Griffin AM, Bell RS. Primary patellar tumors. Clin Orthop Relat Res 1997;(336):199-204. Saglik Y, Yildiz Y, Basarir K, Tezen E, Guner D. Tumors and tumor-like lesions of the patella: A report of eight cases. Acta Orthop Belg 2008;74:391-6. Singh J, James SL, Kroon HM, Woertler K, Anderson SE, Davies AM. Tumor and tumor-like lesions of the patella − A multicentre experience. Eur Radiol 2009;19:701-12. Gottschalk FA, Solomon L, Isaacson C, Schmaman A. Aneurysmal bone cysts of the patella secondary to chondroblastoma. Case reports. S Afr Med J 1985;67:105-6. Ozan F, Toker G. Secondary aneurysmal bone cyst of the patella. Acta Orthop Traumatol Turc 2010;44:246-9. Luna-Pizarro D, Amato D, Arellano F, Hernandez A, Lopez-Rojas P. Comparison of a technique using a new percutaneous osteosynthesis device with conventional open surgery for displaced patella fractures in a randomized controlled trial. J Orthop Trauma 2006;20:529-35. Uvaraj NR, Mayil Vahanan N, Sivaseelam A, Mohd Sameer M, Basha IM. Surgical treatment of neglected fractures of the patella. Injury 2007;38:979-83. Carpenter JE, Kasman RA, Patel N, Lee ML, Goldstein SA. Biomechanical evaluation of current patella fracture fixation techniques. J Orthop Trauma 1997;11:351-6. Levack B, Flannagan JP, Hobbs S. Results of surgical treatment of patellar fractures. 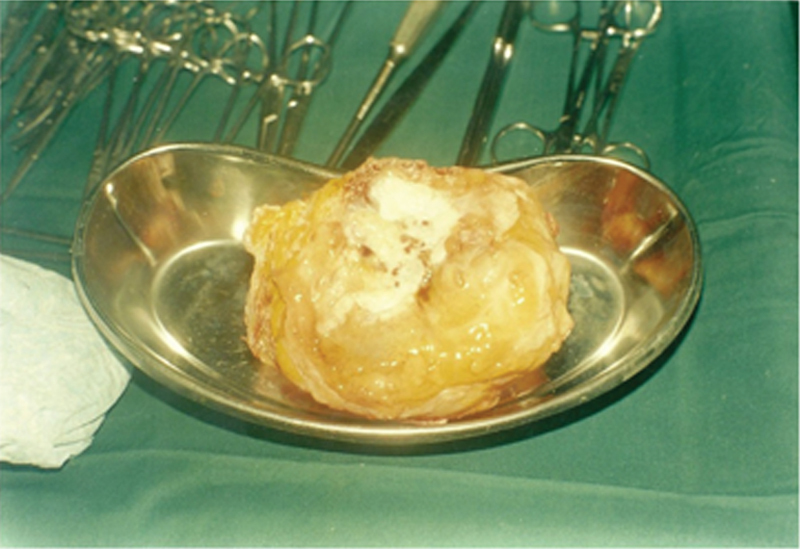 J Bone Joint Surg Br 1985;67:416-9. Onuminya JE. Performance of a trained traditional bonesetter in primary fracture care. S Afr Med J 2006;96:320-2. Fulkerson JP. Normal anatomy. In: Fulkerson JP, editor. Disorders of the Patellofemoral Joint. 4th ed. Philadelphia: Lippincott Williams & Wilkins 2004. p. 1-23. Al-Imam A, Al-Zamili Z, Omar R. Surface area of patellar facets: Inferential statistics in the Iraqi population. Anat Res Int 2017;2017:2685159. Al-Imam A, Al-Imam ML. Human patella morphometry and volumetry, an osteology-based study in the Japanese ethnicity. Eur J Pharm Med Res 2016;3:388-96. Scapinelli R. Blood supply of the human patella. Its relation to ischaemic necrosis after fracture. J Bone Joint Surg Br 1967;49:563-70. Shim SS, Leung G. Blood supply of the knee joint. A microangiographic study in children and adults. Clin Orthop Relat Res 1986;(208):119-25. Roy DR. Osteomyelitis of the patella. Clin Orthop Relat Res 2001;(389):30-4. Fulkerson JP. Dysplasias: Hyperplasia or patella magna. In: Fulkerson JP, editor. Disorders of the Patellofemoral Joint. 4th ed. Philadelphia: Lippincott Williams & Wilkins 2004. p. 137. Lennox IA, Cobb AG, Knowles J, Bentley G. Knee function after patellectomy. A 12- to 48-year follow up. J Bone Joint Surg Br 1994;76:485-7. Gunal I, Taymaz A, Kose N, Gokturk E, Seber S. Patellectomy with vastus medialis obliquus advancement for comminuted patellar fractures: A prospective randomised trial. J Bone Joint Surg Br 1997;79:13-6.